This isn’t your first visit to this world, is it? Peace Lily is the sequel to DAFFODILS and book two of the ‘Katherine Wheel’ series. shows how WW1 impacted on the small community of Cheadle Manor, from the highest to the lowest classes. All I meant to write about was plumbing – or the lack of it – in a tiny Wiltshire village at the turn of the century. My kids were born there in the 1980’s and the history of the place fascinated me. 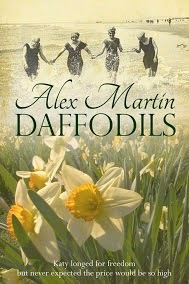 So I began to write and before I knew where I was I was sucked into World War One, as were the characters in my book, Daffodils. The research took ten years, off and on, and I found it moving and humbling. Then I had to find out what would happen after the war and my new book, Peace Lily was born. Who is this series aimed at? Anyone who believes in the power of love, hope and family life. Oh, and who doesn’t think men are more capable than women! If you like Downton Abbey, you’ll love my book. Will there be another book to complete a trilogy? A third book in the Katherine Wheel Series is already mapped out in my head, with a possible fourth a little further into the future. I have tons of other stories knocking about in my Plotting Shed, where I work. Nothing gives me more of a buzz than creating a story out of thin air and a bit of imagination. To produce something that never existed before is a wonderful feeling. Whenever I’ve been down in my own life, it is reading that has been my greatest solace. If I can give that respite to someone else for a day or two, I will have been well rewarded. Tell us about your life. Life has been full to date. Now I have a window, a pause, in which to explore my first passion – writing. I have a shed in the garden where I can be found bashing both brain and keyboard. I’m attempting to express those thoughts and ideas that have been cooking since I was seven and learned to read. You can keep up to date with my progress on alexxx8586.blogspot.com. There was an old black and gold typewriter knocking about my childhood home. When I wasn’t skinning my knees climbing trees or wandering aimlessly in the countryside with my dog and my dreams, I could be found, as now, typing away with imaginary friends whispering in my ear. My first novel, The Twisted Vine, is based on a happy time picking grapes in France in the 1980s. I met some amazing people there but none as outrageous as those that sprang to life on my screen. The next series, as yet un-named, is a ghost story. I’m just listening to the whispers from the other side to get the full picture…. Final question, where can we find you on Twitter?